Pregnancy may limit your every-day wardrobe options, but when it comes to Halloween, being pregnant during the holiday is a great opportunity to double the creativity with your costume. For those moms-to-be looking to incorporate their future bundle of joy into their Halloween festivities this year, here’s a look at some ideas for pregnancy costumes. If you’re looking for a simple costume that won’t require too much extravagance, try a simple pregnancy-themed costume shirt. For a costume that announces your pregnancy in the most obvious way, throw on a red shirt and print out an oversized Prego pasta sauce label and adhere it to your shirt. If you’re looking to go all out with your costume this year, incorporating your baby bump can be a fun way to depict a character or create a unique approach for classic characters. Dress up as a Dr. Seuss Thing and label yourself Thing One and your growing baby Thing Two. 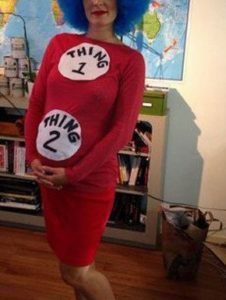 Or if you’re expecting your second child, create a sibling costume and dress your first child up as Thing One instead. Done a long sleeved yellow shirt with a short red T-shirt on top and turn you and your baby into a cute Winnie the Pooh Bear with a full belly of honey. To take this costume a step further, paint your stomach to be Pooh’s favorite food and “carry” around a honey pot during your Halloween party. 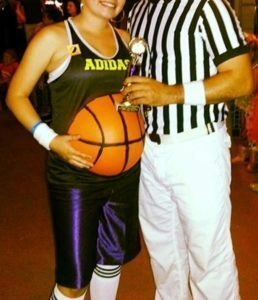 For the sport enthusiast couples looking to have a matching costume, have one partner dress as a referee and the other as a basketball or soccer player. With mom all dressed up, pull up her shirt to reveal her bump and paint her stomach accordingly. For the rest of the evening she can walk around “holding” a soccer ball or basketball. If you and your partner are a fan of pregnancy-related movies, dress up as the characters. For even more fun, mimic the character’s accents or mannerisms to portray your Hollywood pregnancy sweethearts. For the horror fans at heart, pregnancy is the perfect time to incorporate your little one into your love of horror without having to worry about scaring them. Portray the sci-fi classic, Alien, with your baby’s bump transforming into a miniature alien breaking out into the world, or glue doll arms and legs to your shirt with some added paint and makeup for a baby that can’t wait to come out. Whichever approach you decided to take, when it comes to Halloween costumes, pregnancy can be a time to have fun with your bump and kick off the start to mother-child fun with your future bundle of joy.